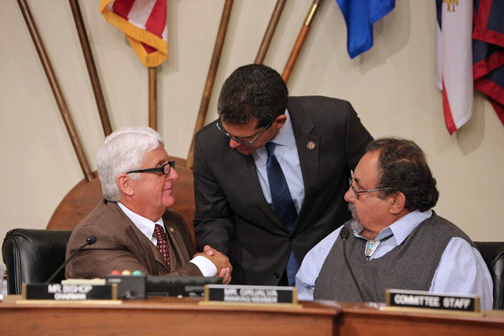 From left: U.S. House Natural Resources Committee Chair Rob Bishop, Pedro Pierluisi and Raúl Grijalva convene during Wednesday’s hearing. The PROMESA Act (H.R. 5278), the bill aimed to address Puerto Rico’s debt crisis, passed in the U.S. House Natural Resources Committee Wednesday with bipartisan support from lawmakers. “PROMESA was approved by the Committee with strong bipartisan support, a remarkable fact in light of the highly partisan nature of the current Congress. We defeated every amendment designed to damage the bill or to disturb its carefully-calibrated contents,” said Resident Commissioner Pedro Pierluisi following the lengthy markup hearing. Some of the amendments that were rejected were introduced by Rep. John Fleming (R-LA) and Rep. Tom McClintock (R-CA) who sought to give creditors better standing, such as removing the automatic stay of litigation and exempting Puerto Rico’s $18 billion in General Obligation bonds from restructuring. Meanwhile, Committee Ranking Member Raúl M. Grijalva (D-Ariz.) voted in favor of the bill, but said in his opening statement that this is not the bill he would have drafted. The PROMESA Act is expected to hit the House Floor for a vote in early June, after which it is expected to move to the Senate. As the hearings on the bill were going on in Congress, members of the Center for a New Economy in Puerto Rico — which invested a significant amount of time sharing its expertise on the complexities of the island’s fiscal and economic situation with members of Congress — said they could not endorse the bill as it stands. ““First of all, this project imposes on Puerto Rico a very high cost in exchange for very uncertain benefits. It forces Puerto Rico to barter away its inherent power to make decisions about its own affairs in exchange for the opportunity of accessing a process which — after sorting more than 45 requirements, steps, and levels — may only allow us the possibility of having a court authorize us (or not) to restructure part of our debt,” said CNE President Miguel Soto-Class. “Those who argue that our elected officials have been incapable of achieving the transformations that Puerto Rico needs are right. But the answer to this problem is not a control board designed by other politicians from outside Puerto Rico,” he said. Hey Buddy!, I found this information for you: "PROMESA advances to House floor; CNE won’t endorse". Here is the website link: https://newsismybusiness.com/promesa-advances-endorse/. Thank you.